Cognitive Dissidence: Bucks Abele Goes MIA. Again. While Barrett tried his best to get everything out in the open as soon as possible, Abele has gone into hiding. He’s sent out two aides—Department of Administrative Services Director Teig Whaley-Smith and Economic Development Director James Tarantino, who’s only been on the job since May—to sell the plan to the public and county supervisors. And he turned down a request to be interviewed by the Shepherd on his plans. If the Legislature approves the deal as is, the county is on the hook for a lot more than the city’s parking garage and TIF. The county has committed $4 million a year in bad debt for the next 20 years—a funding mechanism Barrett rejected—as well as offering to sell nine acres of Park East land to the Bucks owners for $1. Abele’s plan, crafted in secret, could have a big impact on an already strained county budget because the debt that’s collected currently goes into the county coffers. Plus, if the state can’t collect the $4 million yearly for the Bucks, it will reduce the county’s state aid and likely cause property taxes to rise. There are so many questions to be answered about the county’s contributions, but Abele won’t explain to his constituents or county supervisors why he thinks this is the best deal he could negotiate, especially since it appears to be so much worse for county taxpayers than Gov. Scott Walker’s original bonding plan. Adding insult to injury, rumors are rampant that if Abele doesn’t get his way, his Republican legislator buddies will strip the county board’s ability to approve land deals in the pending state budget, further diminishing transparency and accountability in county government. Mayor Barrett has shown that he’s willing to stand behind his proposal to make the arena deal work. If County Executive Abele is so confident about committing county resources to keep the Bucks in town, why won’t he defend his plan in public? 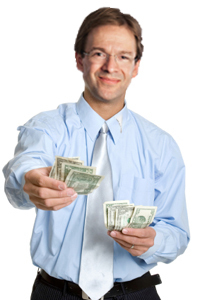 Abele's approach to the arena fiasco is indicative of the way Abele's idea of leadership in general. Like a medieval feudal lord, Abele feels that the poor and working class are there to be exploited and that he doesn't need to answer to such riffraff. After all, he's filthy rich, which makes him feel that he's better than us commoners.